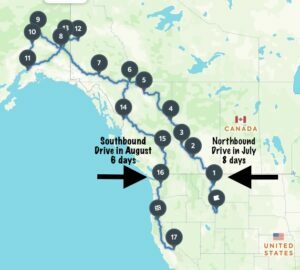 When we drove up to Alaska in July, it took us 8 days and we drove the Icefields Parkway & Alaska Highway (Al-Can). 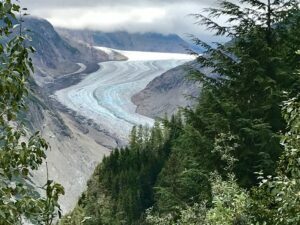 For our southbound trip back to the lower 48 in August, it took us 6 days and we drove the Cassiar Highway. Both trips were beautiful, but different, and I’m so glad we got to experience the two routes. 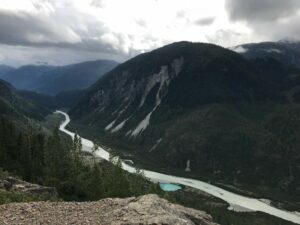 This most recent trip on the Cassiar can be summed in one word: DESOLATE! It is super weird to be on roads and hardly see any semblance of civilization, let alone other cars. It felt apocalyptic. I think we were without cell phone service for 5/6 days of our drive! Day 1 (Aug. 24) – Drive from Anchorage, Alaska to right before the Canadian border. 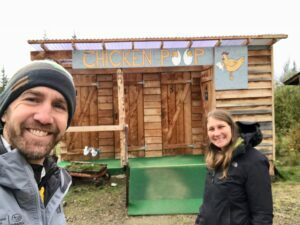 We made sure to stop in the very unique Alaskan town of Chicken. It is called Chicken because the miners who settled the town couldn’t spell Ptarmigan. Ptarmigan is a bird from the grouse family pretty prevalent through Alaska. The current population of Chicken is somewhere around 25 hardy souls, but it goes way down in the winter as the road leading there is not plowed. We camped that night at a BLM Campground not too far from the border crossing into Canada. Two cool things about this above picture. That chicken is made from recycled high school lockers! 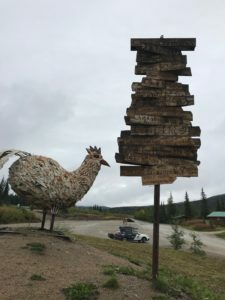 And the signpost lists all other towns with chicken-like names (i.e., Hatch, NM, and Chicken Scratch, NC). Who knew there were so many?? 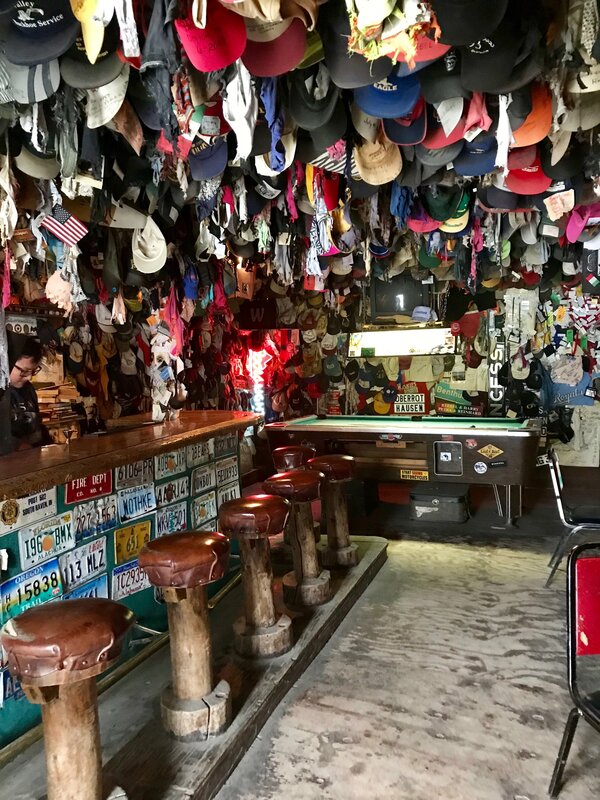 The bottom picture is of Chicken’s bar, complete with its collection of clean (?) undies from travelers (not ours). 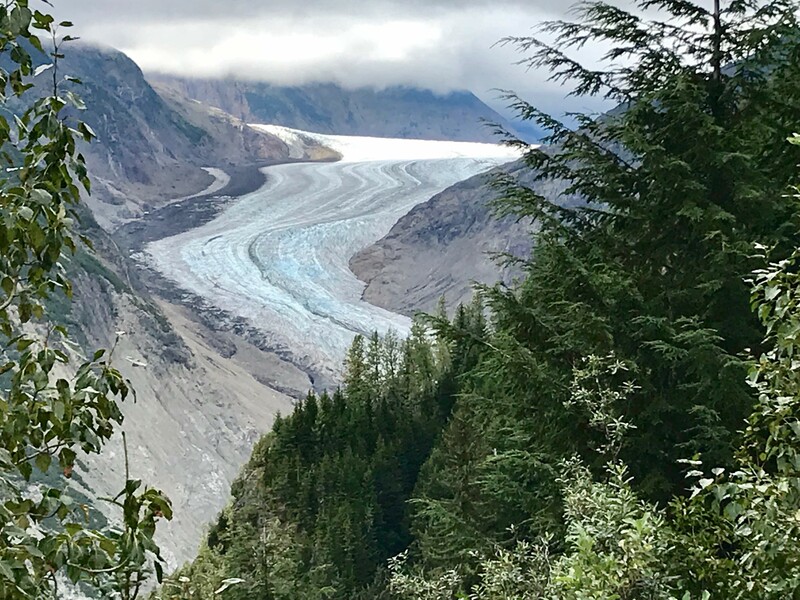 Day 2 (Aug. 25) – After an uneventful border crossing (we are becoming pros! ), our pitstop for the day was a historic town in the Yukon: Dawson City. 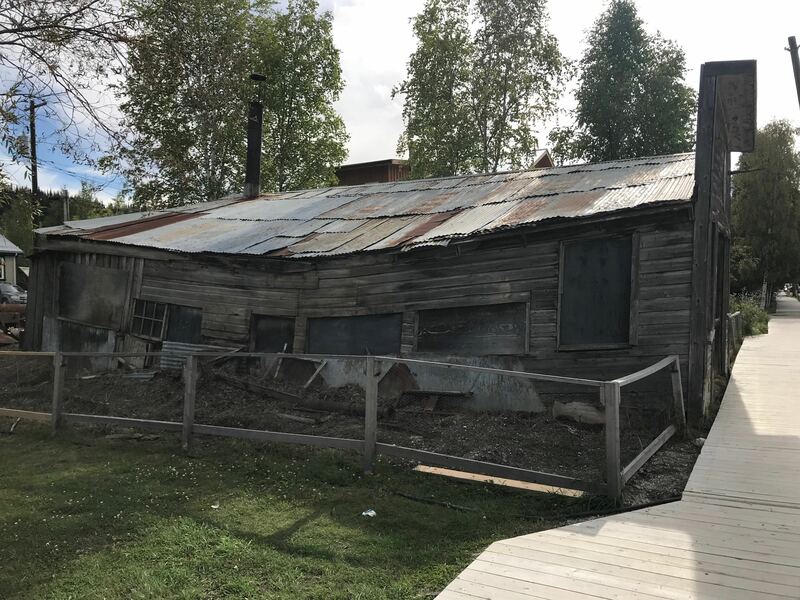 Back in the late 1800s, this place was the center of the Klondike Gold Rush with a population of 40,000! Much smaller now, but an off-the-beaten path must-see for travelers (you actually take a FREE car ferry that operates 24 hours a day to get there). There is a tourist attraction known as the Sourtoe Cocktail, in which you drink a shot with a mummified human toe. 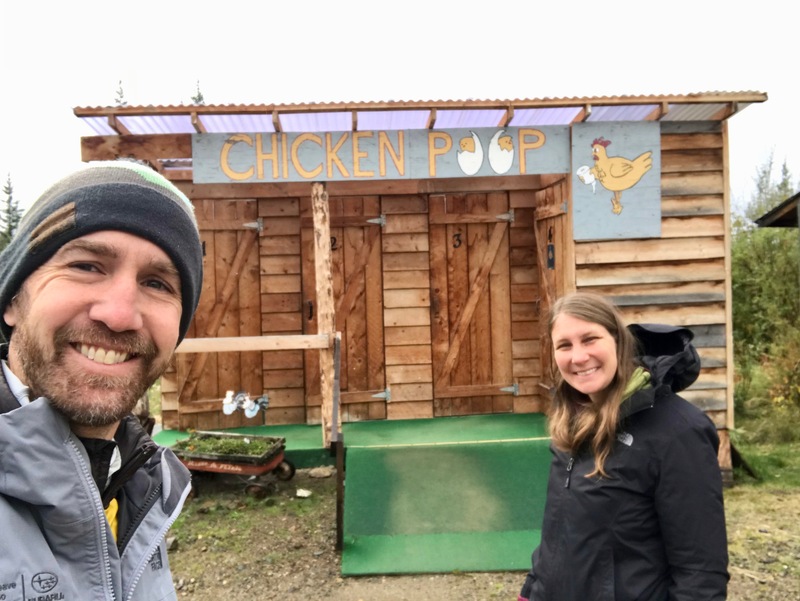 Not our cup of tea, but Justin did partake with his sister on an Alaskan road trip years ago! Lots of other sites to explore walking all around. The town is built on frozen earth (technical term: permafrost) and as the permafrost thaws with global warming, quite a few buildings are sinking/moving. 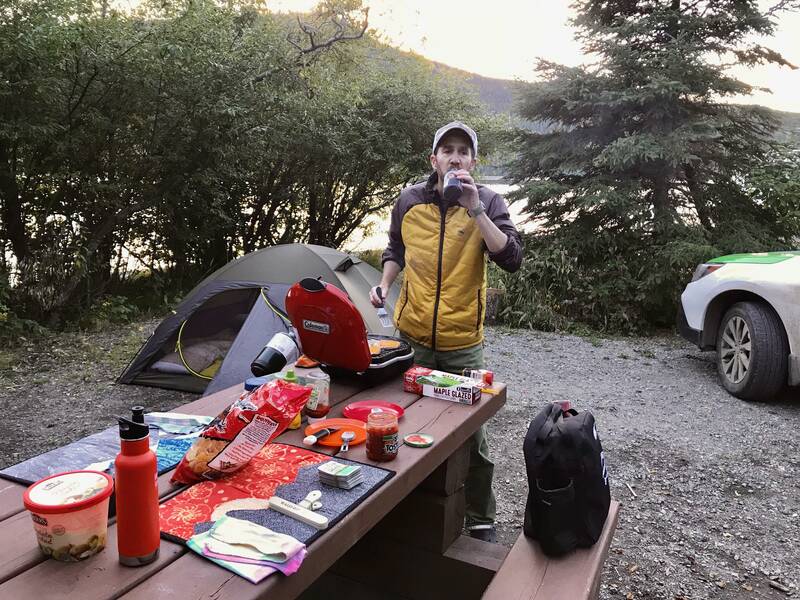 That night we camped in the Yukon at a government campground (for FREE!). Day 3 (Aug. 26) – This was just straight up driving. 500 miles. But we had to put in big miles. 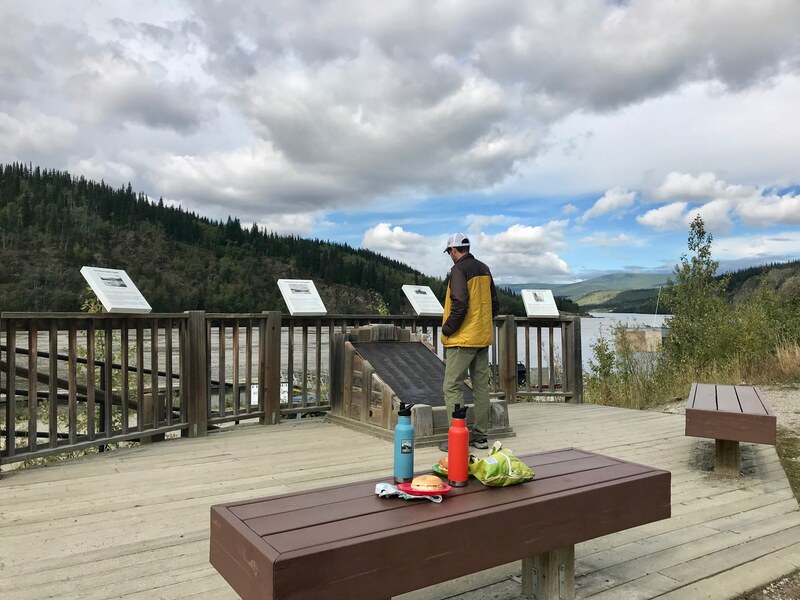 And we ended up picking a stellar FREE campsite on the Cassiar in British Columbia for the night. 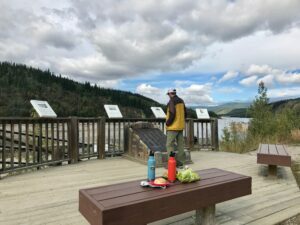 Day 4 (Aug. 27) – We took a short trip off the Cassiar to go to Stewart/Hyder. 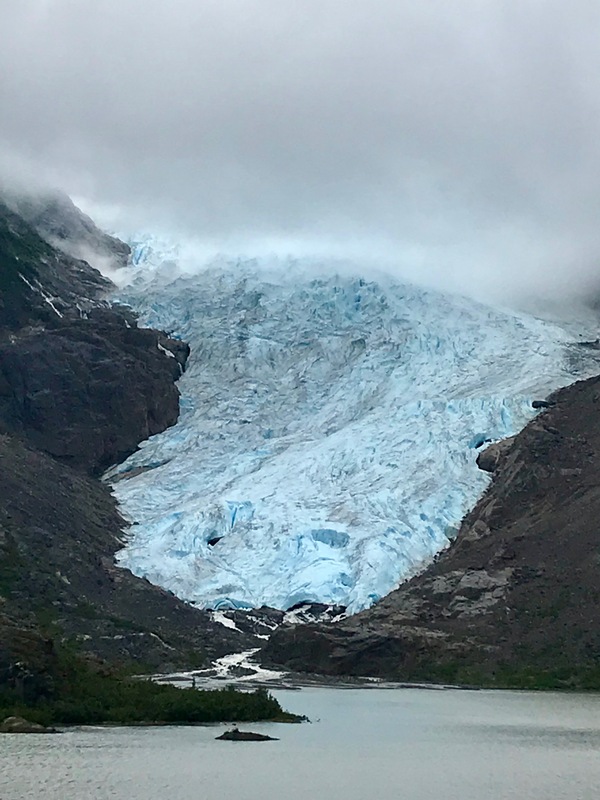 The side road runs through a fjord, with close-up views of some glaciers. So many glaciers! At the end of the dead-end road is 2 tiny towns: Stewart, British Columbia and Hyder, Alaska. 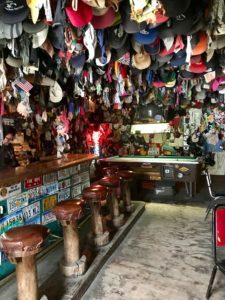 The towns themselves don’t have much to offer, but Hyder, Alaska, is the southernmost point where someone can drive to Alaska, so it’s a popular destination. If you looked at a map, you’d see that Hyder, Alaska, can’t be accessed any other way but from British Columbia. So you have to drive back through Canada to get anywhere else! I think people just drive there and back to say they drove to Alaska. 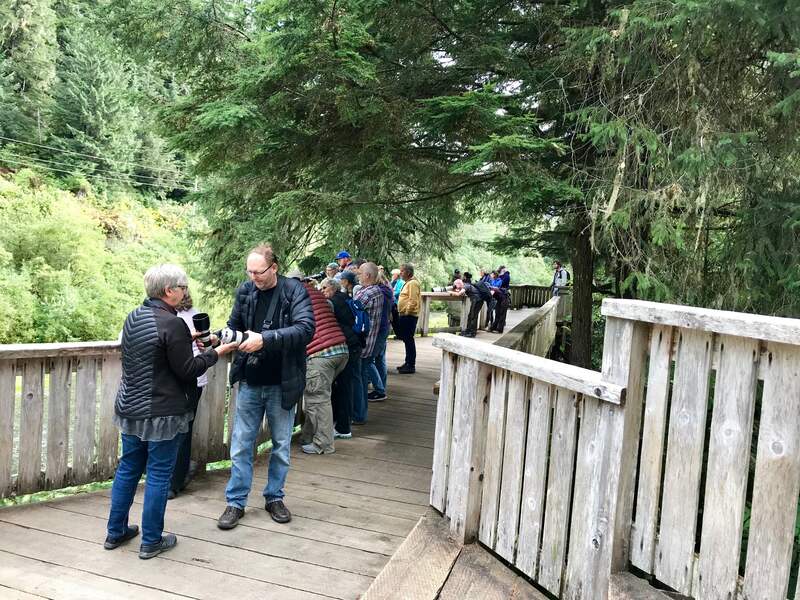 Anyway, besides beautiful scenery, Hyder’s claim is that they also have an area where you can safely watch bear catching salmon from elevated platforms at the Fish Creek Wildlife Observation Site. We had no idea we didn’t have to go all the way to Katmai to do that!! Just kidding, no regrets about the Katmai trip. 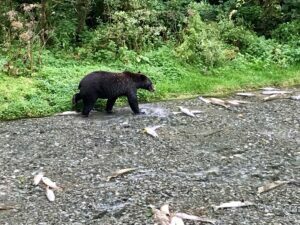 The difference is in this area is that brown and black bear share the fish (well, tolerate each other enough to share the space). 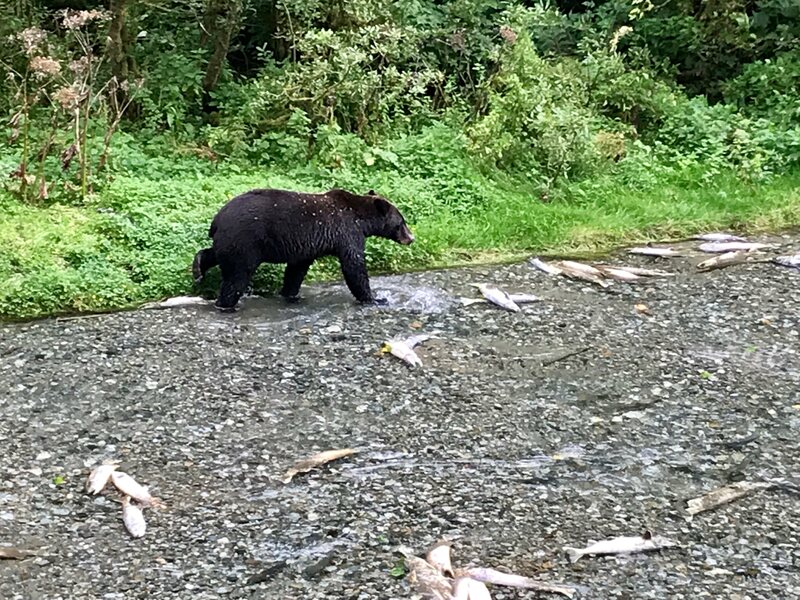 And at this time of year in this part of Alaska, the salmon have already spawned, meaning there were tons of dead fish floating in the river!!! It was quite a site. And the border crossing back into Canada was comical. The agent literally asked us how long we were in Hyder, what our purpose in Hyder was and if we purchased anything … the town has like 10 people and 2 businesses. We wonder what people could possibly do wrong (steal a grizzly bear?). What is anyone’s purpose in Hyder, other than drive in, see the bears and leave? 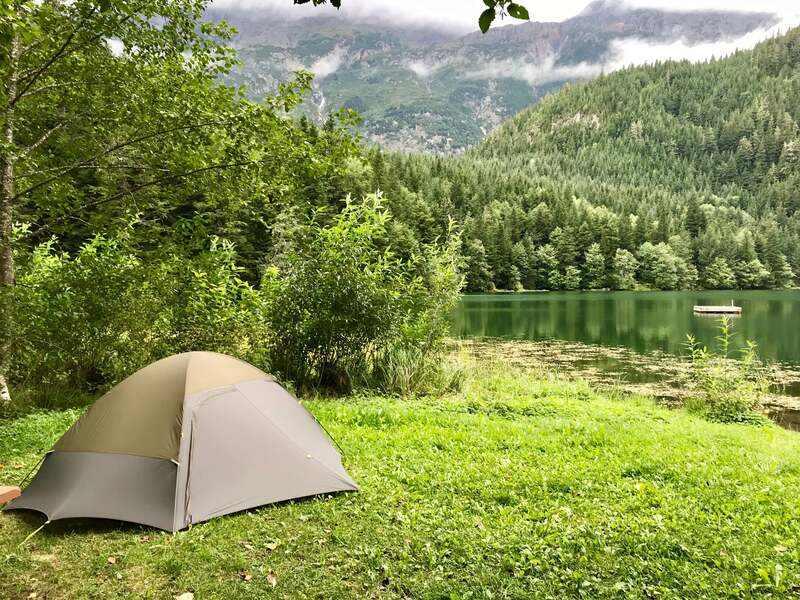 That night, we scored another FREE and gorgeous campsite in British Columbia without even trying (they are everywhere). This one had a floating picnic table (we did not have the cojones to try it). 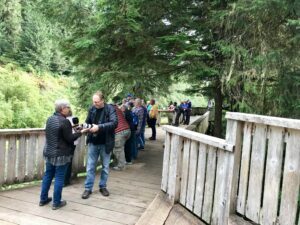 The bear viewing platform in Hyder was more crowded than Katmai’s! Day 5 (Aug. 28) – Another long haul (nearly 600 miles! ), but I told Justin I desperately needed a shower. More specifically, I really wanted to sleep indoors. It had been raining every night we camped, and packing up a wet tent when it is 40 degrees out is hardly my idea of fun. We started looking up hotels on the fly (cause we were getting toward civilization! Service again!). Nothing was cheaper than $100 and had terrible reviews. I looked up Airbnb options and a private basement apartment that included breakfast and had stellar reviews came up for $52. It was a little further than what we wanted to drive, but it was worth it for staying indoors at that price. And the place definitely lived up to its reviews. 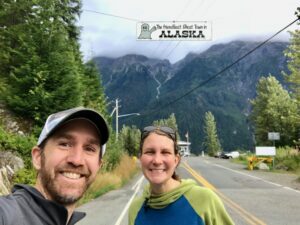 Day 6 (Aug. 29) – We entered the United States! And promptly paid $25 to camp at a state park south of Seattle, where we had the worst night of sleep outside EVER. We’ve camped in a lot of loud places. The park is right under the path for SeaTac planes landing and taking off. Constant airplane noise! My ears are still humming thinking about it. One time on the Appalachian Trail in New York, we camped in between railroad tracks and a highway, with a raging thunderstorm all night. That was quiet compared with this place! All in all, a great trip. I still can’t believe we got to drive to Alaska as part of our summer job in a brand-new Subaru! We are blessed and lucky. You should have had the sourdough shot! I was going to ask if you had to keep going through border checks weaving in and out of the US/CAN…seems a bit silly but I guess they are doing their job. Ugh, and noisy campgrounds, I hear you. I have a draft in my blog about campsites from about two years ago I should flesh out and post, but noise is something on there. Hah, and we stayed at the same place you did on the AT—the trains were annoying but they stopped eventually that night.